If you love the outdoors, you're going to love your vacation in Lancaster. The area offers an amazingly beautiful backdrop for spending your days outside. You'll enjoy the sun on your face as you are surrounded by the tranquil lucidity of Amish Country and the unspoiled land that cradles it. There's no better way to experience the outdoors than hundreds of feet in the air, and Pennsylvania Flights lets you do just that. You can take a breathtaking hot-air balloon ride over the scenic Amish Country and watch the Amish farmers and their horses working their fields. The ride will let you enjoy a unique view of all of the beauty and history the area has to offer. If you take the hot-air balloon ride and the sights of the Amish farms impress you from the sky, when you land you can get a closer look. Head on over to the Amish Farm and House and learn about the Amish way of life. 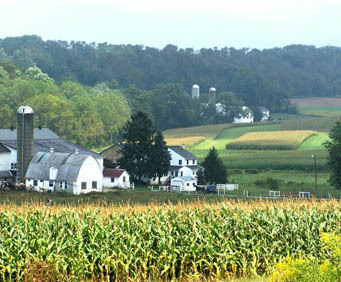 Tour the 25-acres of this working Amish farm and experience the true culture of the area. Or you can spend the day out in the clean, fresh air at Cherry Crest Farm. Here you can get all the exercise you need as you wind your way through the area's famous five-acre corn maze. There are also picnic tables available for visitors to enjoy a relaxing outdoor lunch. Make sure you visit James Buchanan's Wheatland. You can tour the historic grounds of the home of the 15the President of the United States of America. The grounds feature numerous outbuildings including a carriage house as well as gardens and beautiful foliage. Another place that offers an excellent backdrop for a leisurely outdoor stroll is the grounds of the 18the century home of artist Charles Demuth. The gardens of the Demuth Foundation and Gardens have been restored to their original beauty and visitors are welcome to enjoy the beautiful scenery. Lancaster County Central Park is the also a wonderful place to spend your day taking in the sun and enjoying outdoor activities. The park features a swimming pool, skating facilities, tennis courts, picnic facilities, nature trails and play areas for children.